Greetings to all Participating Contractors in the SoCalGas® (SCG) Energy Upgrade California® Home Upgrade Program. Taking effect now, SoCalGas will have its own special monthly newsletter and will contain updates specific to the SoCalGas Only territory. It will help guide you to exciting upcoming trainings/events and prepare you for any new updates. Also note, with the weather starting to heat up, it's important to stay updated and prepared for the busy season. Please reach out to your account management teams for any questions or if you are in need of a sales refresher! As of now, 74% of the SoCalGas Only program incentive budget is remaining. Budget updates are scheduled to go out bi-monthly unless stated otherwise. Please contact your account managers to see how you can take advantage of the remaining incentive budget. It is extremely important to reserve and receive confirmation for your projects before you begin construction. Not only does this help ensure that your customer's project qualifies for incentives, it also protects your company from liability and maintains your good reputation with your customers. Participating Contractors will receive bi-weekly budget updates from account managers to help with your planning. Smart Thermostats - Participating contractors may now add smart thermostats as a stand-alone measure to all projects! This means, the measure will not contribute to the minimum number of measures or the 10% minimum energy savings requirement but will add to the overall incentive. Customers are eligible to receive $100 for the following qualifying smart thermostats: Nest Thermostats (all models), ecobee (Smart Si, ecobee3 and ecobee3 lite, ecobee4), Honeywell LyricTM Wi-Fi Thermostats (Lyric Round - 2nd generation, Lyric T5, Lyric T6). Pool Heater - This energy efficiency measure is the installation of gas-fired pool water heaters having two tier options for the Thermal Efficiency of 84%-89% and 90% or higher. This will be available in both the Advanced Home Upgrade and Home upgrade pathways. It will be considered a stand-alone measure meaning, the measure will not contribute to the minimum number of measures or the 10% minimum energy savings requirement but, will add to the overall incentive. Customers are eligible to receive up to $750 depending on the thermal efficiency. Auto Diverting Tub Spout with TSV - This measure is also available as a stand-alone measure in both project pathways and will be worth $30. Please note this technology cannot be combined with a tankless water heater. SoCalGas' latest updated Contractor Participation Agreement is now available on the contractor website and can also be found here. This document must be signed and returned to account managers in order to remain active in the program. Please ask your account management if you have any questions about any changes. At the Technical Training on June 6, 2017 copies of the new Pocket Reference Guide (PRG) were distributed to those in attendance. If you have not had a chance to review the PRG, reviewing it will give you valuable insight and information. If you do not have a copy of the PRG, there are two ways to obtain the guide: by contacting your ICF Account Manager for a hard copy of the guide, or by logging into the contractors' website and downloading an electronic PDF version you can store on your phone, tablet or computer. The PRG is packed with useful information designed to help contractors and auditors easily navigate their way through onsite inspections. Much of the information within the PRG will also be useful to people in your company responsible for submitting documents and information to the Program. The hard copy is designed to withstand tough use in the field. It is printed on a waterproof stock with a spiral wound binding. All these features make it easy to slip in your pocket, drop in your tool box, or stash in the glove box of your truck. 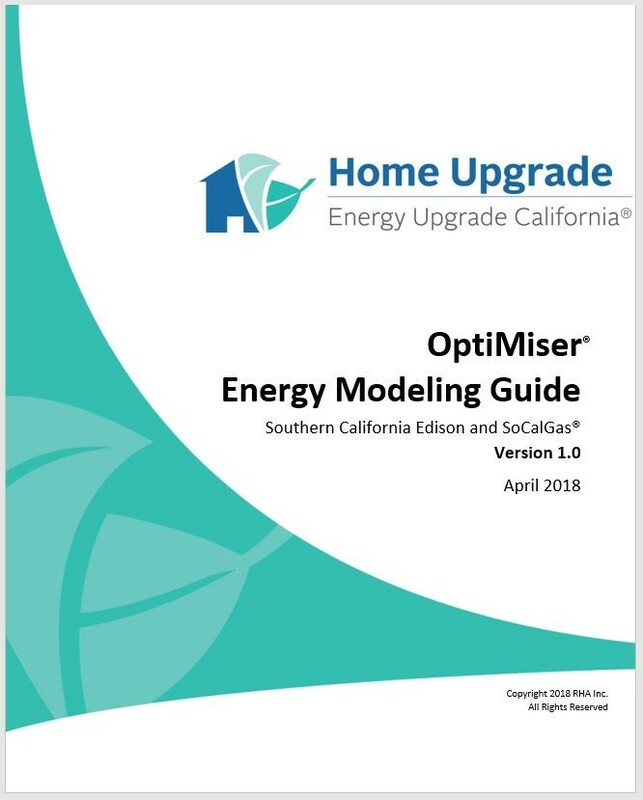 The Energy Upgrade California® Home Upgrade Program has two approved energy-modeling software products authorized for use in the Advanced Home Upgrade path: OptiMiser® and Snugg Pro. Many of you are familiar with Snugg Pro and the related user's guide produced by the Program. For those of you using OptiMiser, or contemplating its use, we are pleased to announce we will be releasing the OptiMiser Energy Modeling Guide very shortly. The guide will be available in time for the technical training scheduled for May 16. Once complete, the OptiMiser Energy Modeling Guide will be available for download in the energy modeling resources section of the contractor resources website. The OptiMiser Energy Modeling Guide is designed to help contractors and auditors navigate the software while using Program-approved values within their energy-models. The guide includes direction for modeling default path projects, custom projects and custom projects with utility bill calibration. In addition, there are useful tables, formulas, and default value tables. If you have not had a chance to use OptiMiser, or are interested in what it can do for your business, OptiMiser offers 30-day free trials. Once you sign-up you will be able to build energy-models from simple to complex, calculate energy-savings information, utilize the report functions, and much more. For more information go to https://optimiserenergy.com/ and click on the GET OPTIMISER link near the top-right side of the page. When it comes to creating precise energy models nothing beats obtaining fast, accurate and repeatable results. That's why the Program created and made available to contractors an Excel document titled "QC Tools." The document was created for use during an audit (either test-in or test-out) and gives the auditor the ability to record project information. Once back at the office, the values from the QC Tools can be quickly and easily plugged into the energy-modeling software of your choice. For contractors not using energy-modeling software, the QC Tool is an indispensable tool to help you get the most for your customer. The Introduction Tab gives a detailed description of each of the other six tabs, specific examples of their use, and informs the reader if that tab is required by the Program to be completed. The Combustion Safety Tab is the form used by the RHA's Energy Field Technicians. Use it to document CAS/CAZ details for attended and un-attended appliances. Color-coding red and green results easily identify pass and fail criteria. A simple click of a button resets the form allowing it to be used repeatedly. The Dimensions Tab lets you easily calculate conditioned floor area, volume, average ceiling height, wall and window area by orientation, and window area as a percentage of wall area. These calculations are performed by entering a minimal number of dimensions. 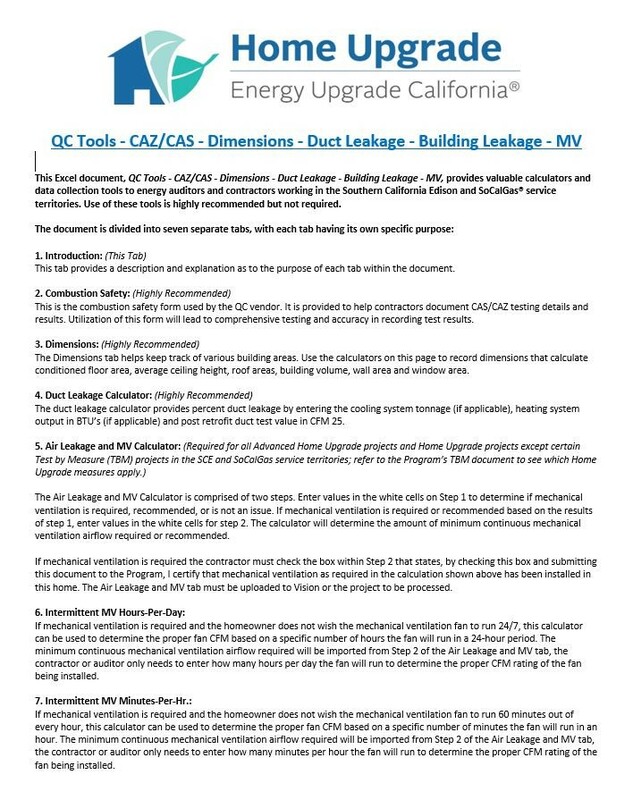 Duct Leakage Calculator Tab: By entering just three values, the duct leakage calculator calculates system airflow, duct leakage percentage, and whether the system meets the 10% maximum leakage requirement. This tab can calculate two separate duct systems at once and calculates system airflow based on cooling tonnage or heating output, whichever is greater. Air Leakage and MV Calculator Tab: There are two calculations that take place on this form. First, values are entered in the white cells on step 1 to determine if mechanical ventilation is required, recommended, or is not an issue. If mechanical ventilation is required or recommended in step 1, enter values in the white cells in step 2. The calculator will determine the amount of minimum continuous mechanical ventilation airflow required or recommended. Intermittent MV Hours-Per-Day Tab: If mechanical ventilation is required, you can set up the MV fan to run for a specific number of hours per day as opposed to running 24/7. By using the MV airflow required and entering the desired number of hours of operation, one can easily determine the correct fan airflow for intermittent use. Intermittent Minutes-Per-Hr. Tab: Just as with the Hours-Per-Day above, you can set up the MV fan to run for a specific number of minutes per hour as opposed to running continuously every hour. By using the MV airflow required and entering the desired number of minutes per hour of operation, one can easily determine the correct fan airflow for intermittent use. Do your team members start by offering standard equipment, then "upsell" with a pitch for more energy efficient models that qualify for Home Upgrade? There may be a better way. Why not lead with the value of energy efficient models? By starting with equipment that saves more energy or qualifies for utility incentives like Home Upgrade, your team can build customer trust in efficient models. And with financing from the state-sponsored Residential Energy Efficiency Loan (REEL) program, your customers can finance single-measures, whole house upgrades, and even use up to 30% of the loan amount to finance other related home improvements alongside efficiency measures. Become a REEL Participating Contractor by visiting www.thecheef.com/contractors, or learn more by contacting the REEL Contractor Support team at 1-800-484-0109 or REEL@frontierenergy.com. As a result of continued success with customer participation, the REEL program is growing. The program just launched a new GoGreen Financing brand and a revamped homeowner-facing website, with summer 2018 advertising and contractor resources coming next month. Plus, the program is adding two new local lenders - stay tuned for more details. Are you or a member of your staff looking to become BPI BA certified? Participating Contractors with a BPI BA contractor on staff are eligible to offer Advanced Home Upgrade projects to their customers for larger incentives and higher energy savings. This year, our BPI certifying partner is offering a blended learning experience meaning, less time in the classroom! This home energy auditor course introduces building science principles and offers hands-on blower door training. Includes a 16-hour webinar, field training with equipment (in person), practice questions, and written field certification exams. Don't forget to contact your Account Manager to receive your discount code to instantly receive $150 off the retail price. More details to come via email to registrants. Join us for Technical Training! Breakfast and lunch will be provided to attendees. Click here to Register. Greetings to all Participating Contractors in the Southern California Edison (SCE) Energy Upgrade California® Home Upgrade Program. In this newsletter, you will find updates only for the joint SCE/SoCalGas® Territory. Please take note of all the upcoming trainings and reach out to your account management team for any questions. As of now, 54% of the SCE program incentive budget is remaining. Budget updates are scheduled to go out bi-weekly unless stated otherwise. Please contact your account managers to see how you can take advantage of the remaining incentive budget. Due to the limited incentive funds for 2018, it is extremely important to reserve and receive confirmation for your projects before you begin construction. Not only does this help ensure that your customer's project qualifies for incentives, it also protects your company from liability and maintains your good reputation with your customers. Participating Contractors will receive bi-weekly budget updates from account managers to help with your planning. Previously, when black organic matter (BOM) was identified in a household, the program required remediation of the BOM. The Building Performance Institute (BPI) the program has determined this process will no longer be required. When a contractor, auditor or Energy Field Technician identifies BOM, a Notice of Unsatisfactory Conditions (NOUC) must be completed. The comments section of the NOUC should be used to describe the BOM, its location, and a recommendation that it be inspected and remediated. The completed NOUC must be signed by the homeowner or the "Customer refused to sign" box shall be checked. One copy of the form is to be left with the homeowner, one copy is for the contractor or auditor's files and one copy must be submitted to the program. A blank copy of the Notice of Unsatisfactory Condition can be found on the contractor website here. The latest updated Contractor Participation Agreement for SCE/SoCalGas is now available on the contractor website and can also be found here. This document must be signed and returned to account managers in order to remain active in the program. Please ask your account management if you have any questions about any changes. At the Technical Training on June 6, 2017, copies of the new Pocket Reference Guide (PRG) were distributed to those in attendance. If you have not had a chance to review the PRG, reviewing it will give you valuable insight and information. 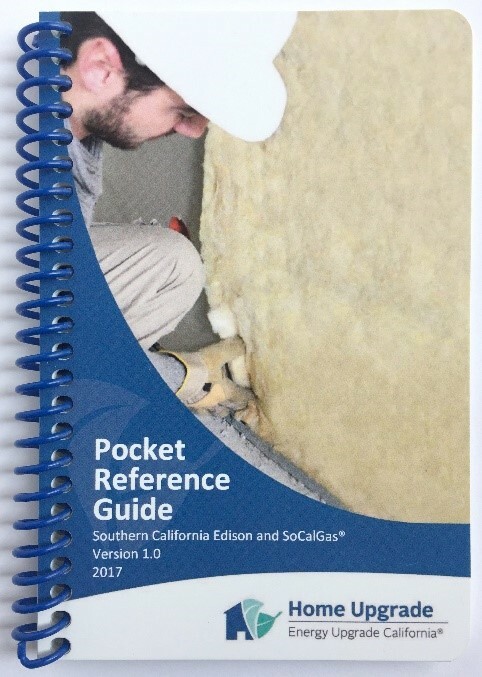 If you do not have a copy of the PRG, there are two ways to obtain the guide: by contacting your ICF Account Manager for a hard copy of the guide, or by logging into the contractors' website and downloading an electronic PDF version you can store on your phone, tablet or computer. The hard copy is designed to withstand tough use in the field. It is printed on a waterproof stock with a spiral wound binding. All these features make it easy to slip in your pocket, drop in your tool box or stash in the glove box of your truck. Once back at the office, the values from the QC Tools can be quickly and easily plugged into the energy-modeling software of your choice. For contractors not using energy-modeling software, the QC Tools is an indispensable tool to help you get the most for your customer. gives a detailed description of each of the other six tabs, specific examples of their use, and informs the reader if that tab is required by the Program to be completed. is the form used by the RHA's Energy Field Technicians. Use it to document CAS/CAZ details for attended and un-attended appliances. Color-coding red and green results easily identify pass and fail criteria. A simple click of a button resets the form allowing it to be used repeatedly. lets you easily calculate conditioned floor area, volume, average ceiling height, wall and window area by orientation, and window area as a percentage of wall area. These calculations are performed by entering a minimal number of dimensions. By entering just three values, the duct leakage calculator calculates system airflow, duct leakage percentage, and whether the system meets the 10% maximum leakage requirement. This tab can calculate two separate duct systems at once and calculates system airflow based on cooling tonnage or heating output, whichever is greater. If mechanical ventilation is required, you can set up the MV fan to run for a specific number of hours per day as opposed to running 24/7. By using the MV airflow required and entering the desired number of hours of operation, one can easily determine the correct fan airflow for intermittent use.